On the way to Jim's Rotary International convention in New Orleans this spring, we stopped in North Carolina to visit Fran's brother Jim and sister Betty and their families. So it seemed like a good idea to visit Fran on the way to the Grand Canyon. We had a great time. I had never thought of Kansas as a destination vacation, but there was a lot to see in the couple of days we were there and it was of course great to see my relations. 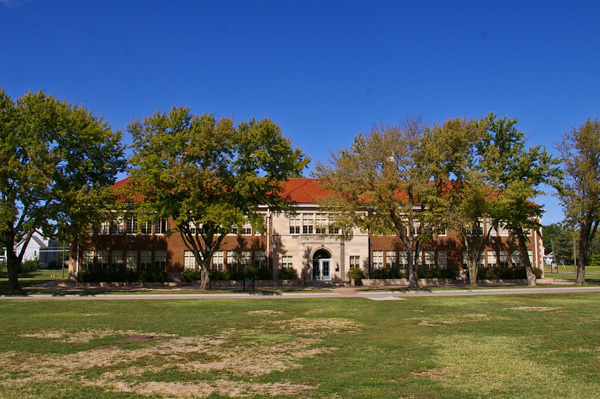 The Brown Versus the Board of Education National Historical Site is located in Topeka, KS. To get the big picture, which was more complicated than I knew, click on the link. This particular location was the "colored school" in one of several independent cases that were combined into one by the NAACP to take to the Supreme Court. The exhibits were eye-opening – especially the introductory film. Another Brown associated with Kansas is John Brown, the revolutionary abolitionist. 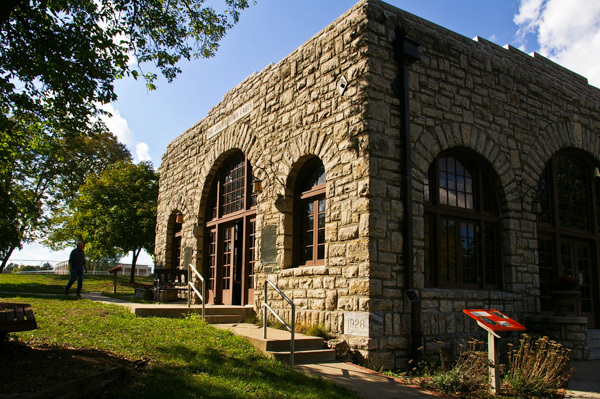 The John Brown Museum in Osawatomie, KS, is dedicated to his activities within "Bleeding Kansas." The Kansas-Nebraska Act of 1854 dictated that popular sovereignty would determine whether slavery would be allowed in Kansas and the rest of the Louisiana Territory. In response Brown came to Kansas in 1855 to agitate against slavery. Both sides share blame for the violence that ensued. 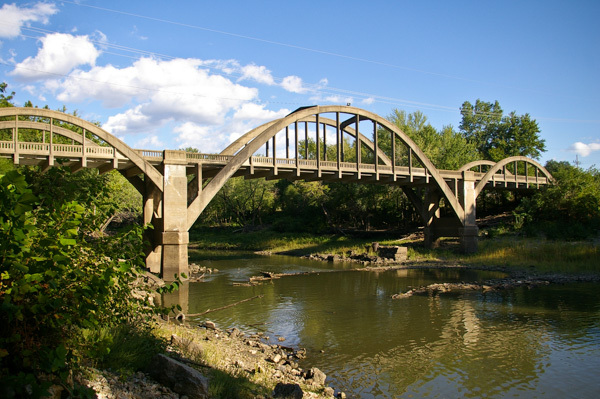 Historical sites throughout the neighboring area of Kansas document the various atrocities. Brown himself, according to the information at this museum, was a more complicated figure than the popular images held by either side of the question. 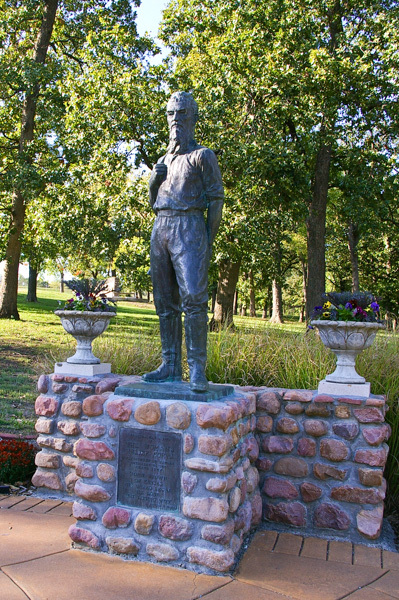 The "Battle of Osawatomie" took place in August, 1856. This museum is well worth a visit. I also recommend checking out their web site at the link above. Brown was injured and one of his sons was killed. He & his supporters retreated across the Marais des Cygnes river – the name means "Marsh of the Swans." There they watched Osawatomie burn. The next day we visited the museum dedicated to the Steamboat Arabia in Kansas City. I have no pictures - check the information at the link. 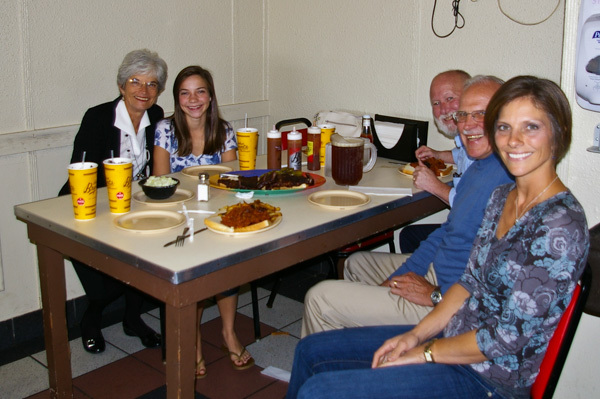 Afterwards we gathered at Arthur Bryant's for a delicious BBQ meal. Pictured are Judy, Brooke, Jim, Fran & Lindsey. It was great time together. 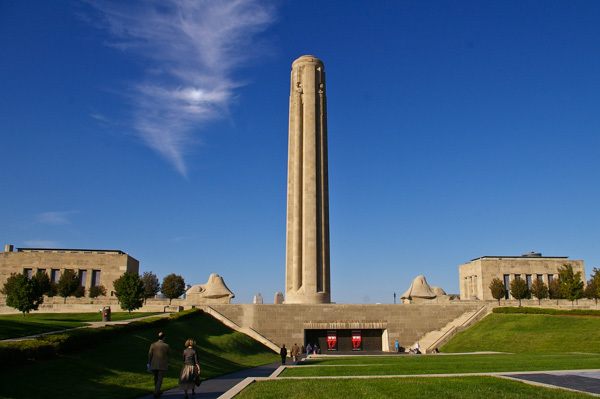 Our next stop was the World War I Museum in Kansas City. I have always been somewhat puzzled about the genesis of WWI and this museum helped me understand why – it was very puzzling! The museum's strength is documenting the process and effects of the war. It provides a deep look into what turned out to be the long march to WWII. 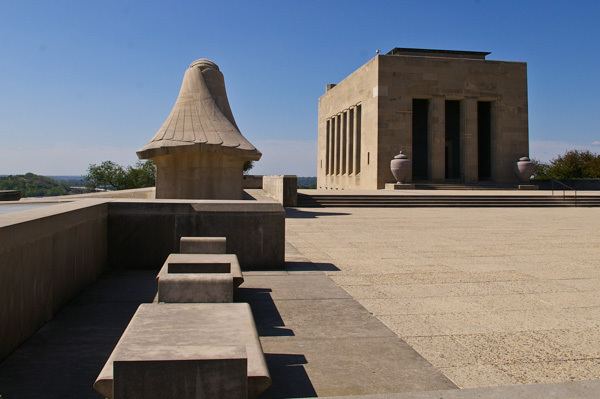 The exterior design was part Art Deco and part Egyptian Revival. Two sphinxes face east and west. Their wings cover their faces. This east-facing sphinx is hiding from the horrors of war. The west-facing one is facing the future, which is unseen and unknown. The entrance to the museum, shown in the picture above below the tower, is intended to suggest a bunker ... and it does. 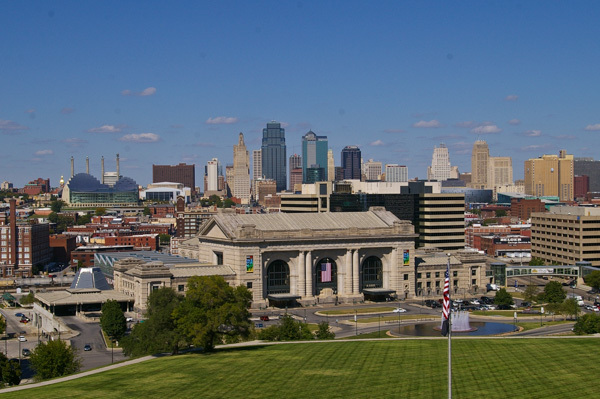 From the top of the tower we looked over the Kansas City (Missouri) skyline. The large building in the foreground is Union Station. Later that evening we attended a concert at the newly opened Kauffman Center for the Performing Arts. It is the swoopy glass building to the left of and behind the station. Emanual Ax played Beethoven. It was a wonderful interlude prior to our Grand Canyon adventure. The next morning Fran drove us to the airport and we departed for Phoenix, AZ, to meet our group for the Grand Canyon tour.